The $4 million for federal, state and tribal projects will help prevent, contain, control and monitor invasive quagga and zebra mussels in the West. A Reclamation biologists collect quagga mussel, water quality samples, for research of quagga mussel habitat suitability. The funding we are announcing today will be used on efforts to prevent their spread while improving ways to manage facilities when the first sign of these invasive mussels is detected. The Bureau of Reclamation has allocated more than $4 million for federal, state, and tribal projects to prevent, contain, control, and monitor invasive quagga and zebra mussels in the West. This funding advances actions announced by Secretary of the Interior Ryan Zinke in June 2017 as part of the initiative called "Safeguarding the West: Actions to Strengthen Federal, State, and Tribal Coordination to Address Invasive Mussels." This funding builds on $1 million in 2017 to support initiatives by the federal government, as well as work by the Western Governors’ Association, western states, and tribes to protect western ecosystems, water infrastructure, and hydroelectric facilities from invasive mussels. "For more than a century, Reclamation and its partners in the West have invested in water infrastructure that is today at risk from invasive quagga and zebra mussels," Commissioner Brenda Burman said. "The funding we are announcing today will be used on efforts to prevent their spread while improving ways to manage facilities when the first sign of these invasive mussels is detected." "The fight against invasive mussels in the West requires collaboration and partnership at all levels of government, including, importantly, those between Reclamation and Western states," said the Western Governors’ Association. "With this new funding, western states will be able to enhance invasive mussel management at many levels, including research, monitoring, prevention, and enforcement." Invasive mussels pose challenges for Reclamation and others who manage water. Invasive mussels are prolific breeders and settle on or within water facility infrastructure such as water intakes, gates, diversion screens, hydropower equipment, pumps, pipelines and boats. Infested water and hydropower infrastructure can fail or choke off water transmissions. The mussels also negatively impact the natural ecology, which can be detrimental to native and endangered species, including native fisheries. 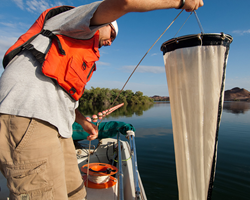 To learn more about invasive mussel management and research at Reclamation, please visit https://www.usbr.gov/mussels.